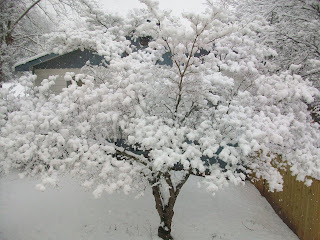 This was the view outside my kitchen window one week ago during the last snow. This is normally a beautiful native dogwood which in spring, looks just like this but with flowers! 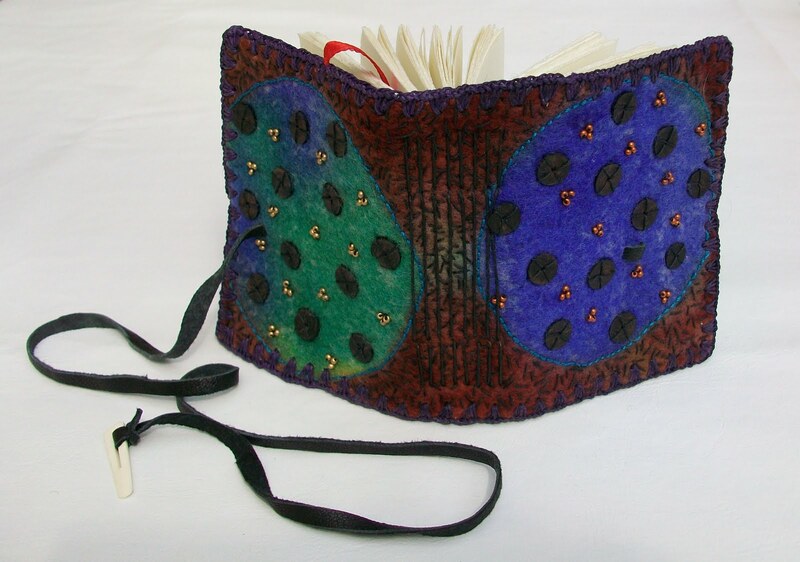 I've been working on new FeltBooks, three more this week and am very thrilled to announce- Hot Off The Press - that I will be teaching the resist dye class and bookbinding in Amerisfoort, Holland May 1-3, 2010 AND on Lopez Island in the San Juan Islands off Seattle on June 17-18 (resist dye workshop), 18th - slide show and 19-20 (the book making). 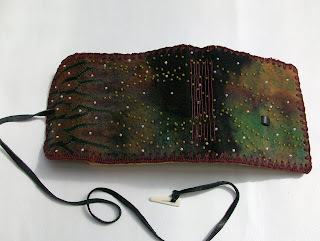 I am also teach the dyeing and books at several other workshops this year. I try to list them all in the Workshop Section of my web page sooner or later, so if you are interested write me or check out my web page for classes near you. Okay, I do have to figure out how to move these photos around. That's tomorrow's learning curve. Last Saturday in Studio B (the basement dye studio) I ran a "The Dyemaster Works For You" workshop in which I do all the dyepots and the student(s) madly felt blanks; wrap, clamp and tie the felts for resisting and then open them back up after their time in the dyepot. We ran 15 dyebaths and got some great pieces. I'll take photos later and post them because I also got to do quite a bit of work along with the dyepots. 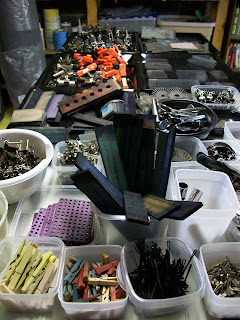 Here's a photo of the "neatly" piled up resist tool table. It makes my heart beat faster just to look at it. And the best news of all is that spring has arrived in my back yard. I have never been so happy to feel that soft air which is so unique to springtime in the south. I live on my screen porch all spring, summer and fall and have been desperate to be able to sit on the futon and not have to wear 15 layers of sweaters! 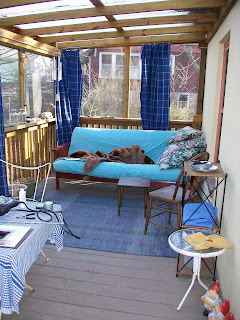 Here is a shot of the porch in early March. Soon the floor boards will be painted, the rugs will come out, tables, chairs, books, flowers and gin & tonics will grace the space. Wow. It really takes a while to get write a blog post. It's time to work already! your books look fantastic! 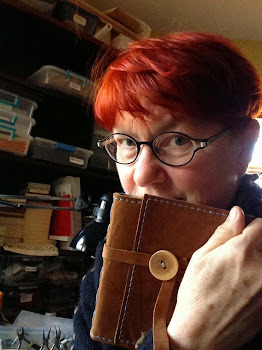 I love the longstitch wrap cover - I hold that style close to my heart. It makes for such a lovely little "packet". Wish I could make the course in Amersfoort, that would have been great. Maybe another time. welcome to the great family of feltbloggers....!!! 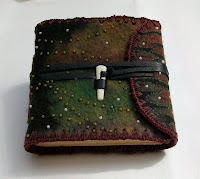 on my felt-blog are links from about 200 feltblogs, come and have a look!! !